"Sometimes the best things are the most simple. Nothing rings of summertime more than lemonade and iced tea. The Arnold Palmer brings them together." Combine lemonade and iced tea in a highball or tall glass. Add ice and stir until chilled. Let a touch of gin usher your Arnold Palmer into the cocktail lounge. how ! just make your own lemonade! Summer staple in our home. Love the mixture, plus you can add a shot of vodka to liven it up if you are in a merry mood! EXCELLENT! Hubby likes iced tea and I like lemonade. We both loved this Arnold Palmer! my family just loved this simple recipe. Followed the recipe exactly, I will certainly be making this again. My favorite summer drink. Try a strong Arnold Palmer-mix in a shot of vodka into each glass. Very refreshing! 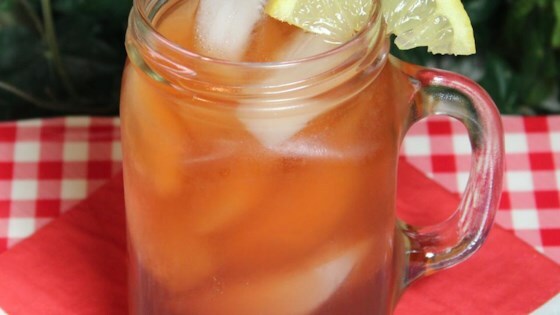 Love the combination of iced tea and lemonade! I made a batch of unsweetened iced tea and used prepared organic lemonade from Costco. Great flavor and a wonderful summer drink! I have been making it for years, but didn't know it had a name! Great drink!